I hope that works. If it doesn't, the link to the CNN page where this appears is here. How can I possibly forget a name like Summar Breeze? I know Summar left a comment on one of the MANY posts on this blog. And I know Summar from twitter. And now, I am getting to know Summar very well. You see, she is a volunteer for METAvivor's new ambassador program. Not only is she a volunteer, she offered to take a lead role as a vice ambassador in the Pacific Northwest. Watch the video. If it doesn't work, click the link to CNN. Keep the tissues handy. Summar never told anyone about this and the only reason I found out is because I was doing a bit of paperwork and stumbled over this on her Facebook page. There are so many reasons why I feel the need to put so much effort into assisting METAvivor in whatever way I can. If you care to join the nationwide volunteer corps of ambassadors, please contact CJ at cj77@comcast.net ..... or leave a comment here and I'll pass the information to CJ. In other news, I want to congratulate Deana and Lisa Hendrickson. They began a push to raise awareness about the need for better treatment, more research, effective screening for lung cancer. The message was taken to twitter and thanks to their tireless efforts, they put together their first tweet-chat last night. 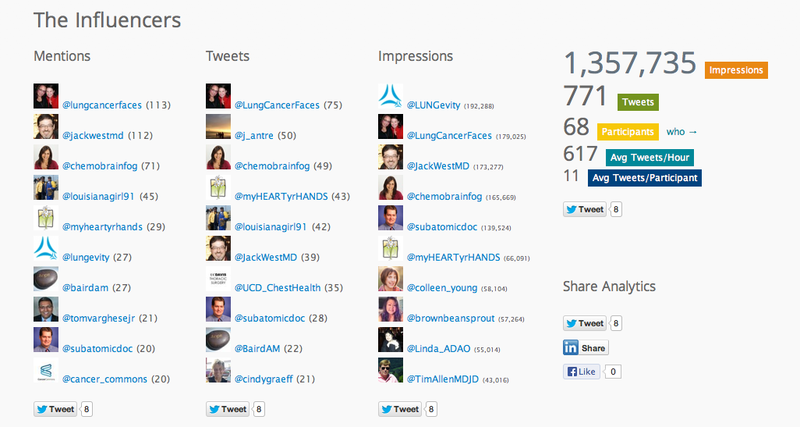 Modeled after #bcsm, last night, it was #lcsm. Lung Cancer Social Media. The chat was moderated by Dr. Jack West, an oncologist who founded GRACE: The Global Resource for Advancing Cancer Education. There were doctors from every discipline, non-profits, cancer centers, advocates and patients all in the discussion. There will be #NoStigma in NO Time at all thanks to the wonderful work of @LungCancerFaces (Lisa and Deana). If you'd like to read what the crowd had to say, the transcript is at Symplur. On that note, have a very happy weekend. Tomorrow is a notable date in my life. There will be a blog post. It will remain up through Tuesday. At least. Or longer. Depends upon how distracted I am by life and butterflies and hummingbirds and dragonflies and frogs. Each and every day, I see something that makes me smile. I'll be wearing my smile and I hope you will do the same.